Potting bench as a kitchen island – with a durable upper surface, this bench can handle cooking pots as easily as planting pots. Shelving underneath also helps with storage of large pots, pans, and accessories. Curtain skirt- if you have a sink with open space underneath you can use a small curtain rod and custom fabric to hide the plumbing and any items stored underneath. It also allows you to add some unique color and patterns to your kitchen. Steel roofing backsplash – For an industrial look, add a fireproof backsplash behind your stove top made of roofing sheet metal. Make sure you choose quality sheet metal, so it looks nice, not cheap. Open backed plate racks – create a visually intriguing area to your kitchen by installing open backed plate racks over existing kitchen windows. You can increase your storage space without blocking out enjoyable daylight. Creative lighting – if you have recessed lighting over an island or workspace, you can put in a few pendant-light adapters to drop those lights closer to the action. Add some decorative fabric shades to really spice up the look of your kitchen. Wallpapered ceiling – choose a subdued pattern or even a striking color wallpaper to line the “5th Wall” of your kitchen and add some pizazz. Not for the faint-of-heart, this option will really make your kitchen unique. Choose your wallpaper carefully, as this can either make or break your kitchen look. 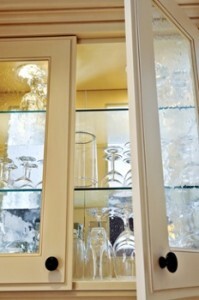 Glass cabinet doors & shelving – with some accent lights inside your cabinets you can show off your fabulous china and flatware as a focal point in your kitchen. Terra-cotta drainpipe wine rack – purchase some inexpensive terra-cotta drain pipes at your local hardware store, paint them a color of your choosing, glue them together and, voila, you’ve got a unique wine rack for your unique kitchen. As you can see, with a little imagination, you can pull some uniqueness into your kitchen until you’ve saved up enough to remodel in full. Make your kitchen space as unique as you are.